Tragedy’ is too soft a word to describe what happened in Uttarakhand this month. It was an unprecedented catastrophe. No one in living memory has seen, as the locals say, so much fury by Nature. It is as if the pent up anger of the Gods burst all the dams and poured water everywhere. In Kedarnath, which was flattened beyond recognition, except the shrine, it was indeed Lord Shiva’s Tandav Dance of destruction. All the rivers ~ Bhagirathi, Mandakini, Alaknanda, Shipra, Sharda and many more ~ rose many metres and flowed with such fury that they devoured everything that came their way ~ human beings, animals, buildings, vehicles, roads and bridges. Bhagirathi spread havoc in Uttarkashi, Rudraprayag and Kedarnath valley and Alaknanda spared no one in Hemkund and other places on its way. Many floors of hotels and houses at Gobindghat, the starting point to the valley of flowers, and Hemkund Sahib just disappeared under the debris deposited by the river. We have all seen this on television ~ buildings and temples falling into the moving waters like packs of cards, carrying with them those who could not escape in time. A frightening spectacle! Continuous heavy downpour for three days, the cloud bursts and the flash floods caused so much devastation that everyone was left dazed. Thousands of pilgrims on their way to fulfilling their lifelong ambition of Chardham Yatra were caught unawares in this unexpected avalanche of destruction. Hundreds of them have been washed away. Even their bodies will never be found. Many got buried under the debris. Some who climbed up to the higher level of hills would have died of cold and hunger as no aid would have reached them. Families have been destroyed. While the extent of this calamity could not be foreseen, the response of the local administration was pathetic. They seemed completely confused and helpless, indeed paralysed, having no clue of what to do. A few incidents reported in the local edition of a newspaper sums up their thorough incompetence to meet with the situation. In Bageshwar, for example, when water was rising in the nearby river, two junior officials were sent to an area under danger of being flooded to ask the people to move out of their houses. “Where should we go?” someone asked. The officials looked at each other; they had not thought of this. The state government was so overwhelmed by the enormity of the task that they did not know where to start. There is a total absence of leadership right from the Chief Minister to the District Magistrate. A Hindi expression describes their predicament most appropriately: ‘Jaise saanp soongh gaya ho’. It was our Army jawans, the Air force, the ITBP and the NDRF which came to the rescue of thousands of pilgrims stranded all along the Chardham yatra route or at Hemkund Sahib. The operation that the armed forces have been carrying on is mind-boggling. It is a herculean effort to evacuate the stranded under extremely challenging conditions. Helicopter pilots are carrying out many sorties every day even in adverse weather conditions at great risk to their own lives. Just the other day, 20 of them lost their lives in the helicopter crash in Gaurikund. It is at times like these that we become confident of the fact that come what may, we still have some excellent institutions. It is these men in uniform who are lifting us out of our despondency. They are not only evacuating people and setting up camps before they are moved out of the place to their hometowns, but they are also feeding them, carrying out their medical checkups, providing them with medicine and other essentials ~ a job which the state administration should have done. That is why every man and woman saved and brought to a safe place has words of praise for our soldiers and is highly critical of the local administration, which has failed even the local people. While the entire focus of the army and other forces has been on the pilgrims and tourists, the administration could have reached the locals in dire need of help. Village after village has been completely destroyed; people are without a roof, food, warm clothing and medicines. With roads and bridges either blocked by landslides or washed away, it is difficult no doubt to reach these people. 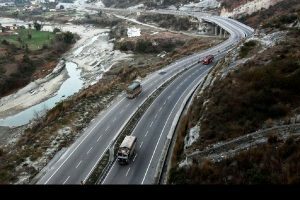 No attempt has been made by the state PWD with the help of Border Roads Organisation to open up alternative routes to reach those villages that must be in urgent need of help. God knows how many have perished of hunger and cold. At the District head quarters, they seem to be absolutely ignorant of the misery that the victims of this tragedy have undergone. One DM, when told by journalists about the sad plight of residents in a particular area of his district, responded with, “I shall look into it.” When journalists could reach those remote areas, what prevented the administration? Indifference or sheer incompetence! Aarti khosla is a former Additional Secretary, Govt. Of India.